Preheat oven to 200°C. Place the lemon juice in a large bowl of cold water. Peel the quinces and cut each into 6 pieces. Place the quince into the lemon water. Place the cinnamon sticks, vanilla bean and seeds, orange rind, sugar, water and quince in a large roasting tray. Cover the tray with aluminium foil and cook for 50–60 minutes or until the quince is starting to soften. Remove the foil, turn the quince and cook, spooning over the syrup occasionally, for a further 30–35 minutes or until the quince is dark red and caramelised. Serve with store-bought vanilla ice-cream, if desired, and drizzle with syrup. Serves 8–10. + The quince will discolour quickly after the skin is peeled; placing it in the lemon water helps to stop the discolouration. 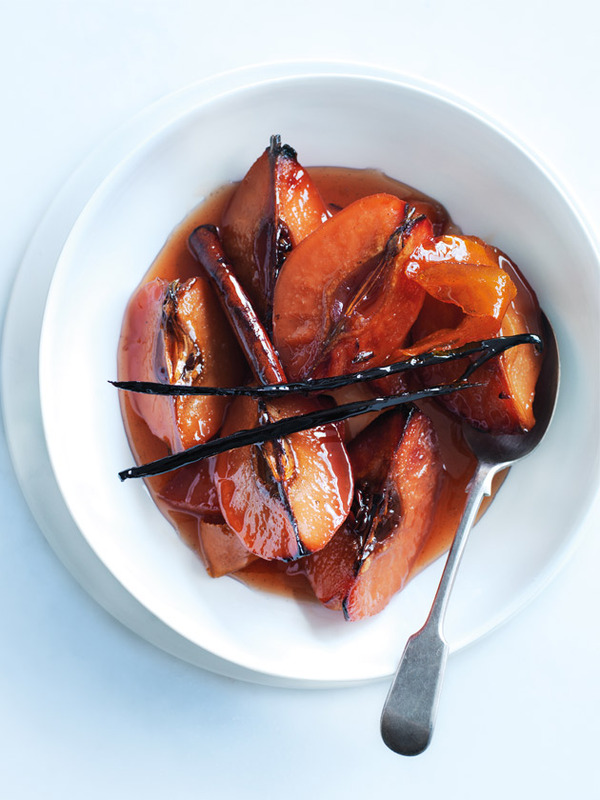 + You can serve the roasted quince with store-bought ice-cream, yoghurt or custard. + Roasted quince will keep refrigerated in an airtight container for up to 3 days.